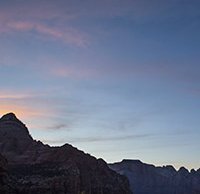 When visiting Zion, Jay P. Morgan of The Slanted Lens did time-lapse photography with the help of some gear from Syrp. To spice up his video, he wanted to rack focus during his time-lapse shooting. How is this accomplished? Firstly, you will want to disable your camera's autofocus. After this, you will want to know where the exact beginning and ending points for your lens' focus range. Morgan recommends marking these points. You then need to determine how often and quickly you want to rack your focus. He opted to do it slowly, so he only changed focus every two or three frames. The final result can be very cool and can add a dynamic touch to your time-lapse videos. When paired with a camera slider, such as the Syrp Magic Carpet CF Slider, racking focus during a time-lapse can result in a very professional-looking video. Check the techniques out in action in the Morgan's latest video.